Overview: It’s Clobberin’ Time! Welcome to the solo adventures of Ben Grimm, one-quarter of the fabled Fantastic Four. Being the blue-eyed idol of millions is not easy, but the Thing pulls it off as he encounters all kinds of heroes across the Marvel Universe. Marvel Two-In-One actually started in the pages of Marvel Feature. That title had been the starting point for the Defenders and had recently been home to Ant-Man & Wasp storyline. The final two issues of Marvel Feature featured Ben Grimm teaming up with the Hulk and Iron Man. The end of issue #12 promised a Thing team-up with Man-Thing in the next issue, but two months later, it was Marvel Two-in-One #1 that was on the newsstands. Marvel Two-in-One remained a bimonthly book until finally going monthly with issue #15. The team-ups collected here are a mixed bag – some issues flow right into the next issue, adding another character into the mix. Other issues seem to come out of nowhere – perhaps a fill-in issue that had been sitting in a file cabinet somewhere in the Marvel bullpen. The Fantastic Four and Alicia Masters make numerous appearances in these issues, and could be read side by side with the Fantastic Four title during this era – keep Essential Fantastic Four Vol. 7 and Essential Fantastic Four Vol. 8 handy while reading this book. What makes this Essential? : This is a great book to give to any reader, young or old, to introduce the Marvel Universe. Ben Grimm is the “everyman” of the Marvel U, — there are numerous logical connections that help make sense of Ben teaming up with diverse characters such as Thor, Man-Thing, Golem, and the Black Widow. While a lot of familiar Marvel writers and artists took turns on this book, the notable name to look for here is Ron Wilson. Ron’s first issue was #12, and he remained one of the main artists on the title for the remainder of the book’s run, as well as the follow-up series, The Thing. Footnotes: Marvel Two-In-One #21 is not included in this Essential volume. That issue teamed the Thing up with Doc Savage. Marvel no longer holds the rights to publish Doc Savage, so it could not be included in this Essential. If you like this volume, try: The Thing comic from 2006 by Dan Slott, Andrea DiVito, and Kieron Dwyer. This eight-issue series put Ben Grimm back in the spotlight of his own title. Ben finds himself flush with money, so he moves out of the Baxter Building and sets himself up in a penthouse apartment. He starts to hang out with the millionaire superhero crown (Tony Stark, Kyle Richmond), which puts him in the sights of Arcade, Sandman, and many other villains. In the end, Ben finds that the money is not the solution to all of his troubles in life. Dan Slott has a wonderful grasp of Ben Grimm, and I wish this series had performed better to last longer. This is definitely a hidden gem from Slott’s catalog of great titles. The entire series was collected into one trade paperback, The Thing: Idol of Millions. This entry was posted in Fantastic Four, Marvel Essentials and tagged Bill Mantlo, Chris Claremont, Fantastic Four, Gil Kane, Jim Starlin, Marvel Two-In-One, Ron Wilson, Roy Thomas, Sal Buscema, Steve Gerber, Thing. Bookmark the permalink. 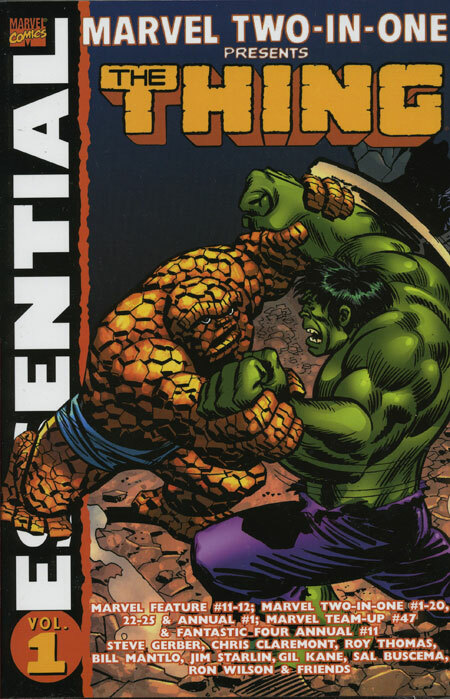 Pingback: Throwback Thursday – Essential Marvel Two-in-One Vol. 1 – WORST. COMIC. PODCAST. EVER! Pingback: Throwback Thursday – Essential Spider-Woman Vol. 1 – WORST. COMIC. PODCAST. EVER!